Do you really want your motorcycle up on a flat bed that’s meant to tow cars? 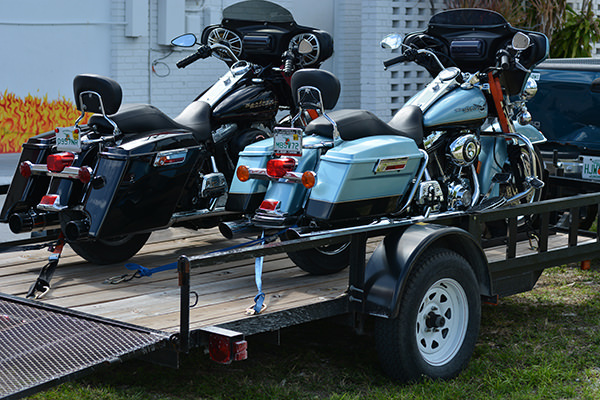 We have a brand new trailer built just for towing motorcycles with two motorcycle wheel chocks and multiple tie down anchors on each side that are anchored through both the floor and the frame. It can accommodate two motorcycles of any size (including the bigger Harley-Davidsons that you wouldn’t trust on anything else) or one trike. We offer 24/7 emergency service. Any time of night or day. Anywhere in the Keys. We’re the only motorcycle repair shop in the Keys, so your bike is going to end up here anyway. Keys Cycles carries a vast selection of parts for Harley-Davidson and tires for all makes and models. Our experienced staff can also help you figure out exactly what you need. Please give us a call and let us know what you're looking for. Includes wheel removal, dismounting and tire mounting, tire balancing and reinstallation of the wheel on to the bike. Hourly rate on all work related to repairs.